The headdress of evil majesty. 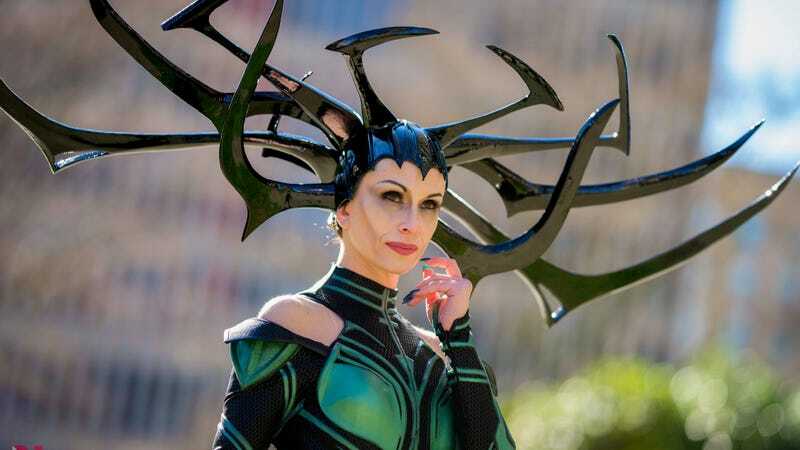 In Taika Waititi’s Thor: Ragnarok, there’s a moment when Hela runs her fingers through her helmed mane, creating luscious tendrils of might and power—inspiring nearly every cosplayer in the world to wonder, “Holy crap, how am I going to create that?” Now, one cosplayer has achieved the impossible, and is free to roam Asgard in her wicked handmade crown. Cosplayer and pattern designer Beverly Downen, who’s known online through her Downen Creative Studio, unveiled a new Hela cosplay at Emerald City Comic Con, achieving second place Best in Show during the cosplay competition. The whole look is extra impressive when you consider a lot of Cate Blanchett’s costume in the film was created digitally. Gaze upon the Mighty Hela... and then probably die because she’s already bored of your face. A full view of Downen’s Hela ensemble. Of course, the standout element has to be the giant headdress. Downen told io9 she’s been working on it for the past seven months, using polyfoam supported by wire and plastic. The helm’s glorious shine isn’t just from Hela’s magnanimous presence; it’s also tinted epoxy. Surprisingly, the whole thing weighs less than three pounds! When it’s put together, Downen says it doesn’t take long for her to feel like the goddess of death. Downen says she’s working on some tutorial videos to show other cosplayers how to make Hela’s bodysuit and headdress, and will also be selling a custom pattern design in her Etsy store for those looking to build their own Hela cosplay from scratch.